The finance profession has undergone a rapid period of change, and this will only accelerate. On the one hand, automation and artificial intelligence are seen as bogeymen threatening jobs – and not only manual or repetitive tasks. A 2014 Oxford University study put finance professionals at very high risk, with an over 90 per cent likelihood of many accounting tasks being automated, while a PwC report earlier this year suggested up to a third of all jobs would be mechanised by 2030. Even if jobs are not lost, they will change, as machines take over not just compliance and other data-based tasks, but pattern-recognition and decision-making through machine learning. At the same time, professional services careers are changing radically. Traditionally, careers were framed within a hierarchical structure leading to partnership. These days, employees are less likely to patiently work their way up the corporate ladder in one place or sector, while employers can sometimes see this desire for more than one career path as a sense of entitlement, creating a growing expectation gap – ultimately leading to high staff turnover. With jobs changing on the one hand, and careers on the other, what does this mean for the future professional? Professionals are now required to look beyond their current skill set and focus on lifelong learning. A number of studies are currently underway into what skills the future professional will need, and how these can be developed, such as those by the UK Government Office for Science, the OECD, and the Economist Intelligence Unit. Traditionally, the professions focused on technical expertise – one might typically spend hours training in specialist areas to qualify as an accountant or a lawyer. However, companies are increasingly looking for individuals who can be charismatic, influential and good communicators – those who can operate in a new environment of networked teams. There is also a real need for modern professionals to be tech-savvy, and understand the constantly evolving modern global marketplace. And none of this negates the skills base that is still necessary in order to operate. Professional expertise, in other words, is becoming both much broader and less immediately definable at a time when the professions themselves are under threat. The original idea of the professions was not just to guarantee levels of expertise, but to share something above and beyond technical skill that furthered the public good. So, what should unify the profession? What unifies a profession is its ethos: the characteristics of people who share core values, aspire to contribute to a higher purpose and exhibit particular virtues. Ethos is a way to communicate the key aspirations and commitment of the profession and to motivate and guide individuals on their professional journey. Ethos is an important guiding principle for young professionals as they learn, develop knowledge and skills, and become initiated into the profession. It takes a long time to develop a professional identity and to become an expert, but it is important that individuals’ beliefs and attitudes become shaped early on, even before they enter the profession. The existing professional ethos functions as a signal that is communicated to aspiring professionals both formally and informally – through compulsory education, higher education, and training; but also stories, role models, language, norms, and expectations. The ethos of a profession could encompass a variety of attributes of character, including virtues such as empathy, courage, fairness, honesty, and integrity. While these moral qualities are dispositions that bring about appropriate conduct, they qualify as moral virtues only insofar as they are governed or guided by the intellectual virtue or capacity that Aristotle calls practical moral wisdom. What should drive us forward? With our we want to challenge the profession. Common experiences, interests and abilities are important to ICAEW members, but are they enough to capture our professional identity? Through the shared purpose and virtues of members, we might distinguish our professional identity and develop a more powerful narrative for our community. Our key insight from the initial discussions is that we can benefit from opening a deeper and richer conversation about what defines us as professionals. Our work has pointed to the complex nature of the profession and the difficulty in understanding its evolving role within society. AuditFutures continues to lead on this by addressing these complex issues in workshops and events that engage ICAEW members and stakeholders. This document is a practical tool to facilitate discussions amongst ICAEW Chartered Accountants. 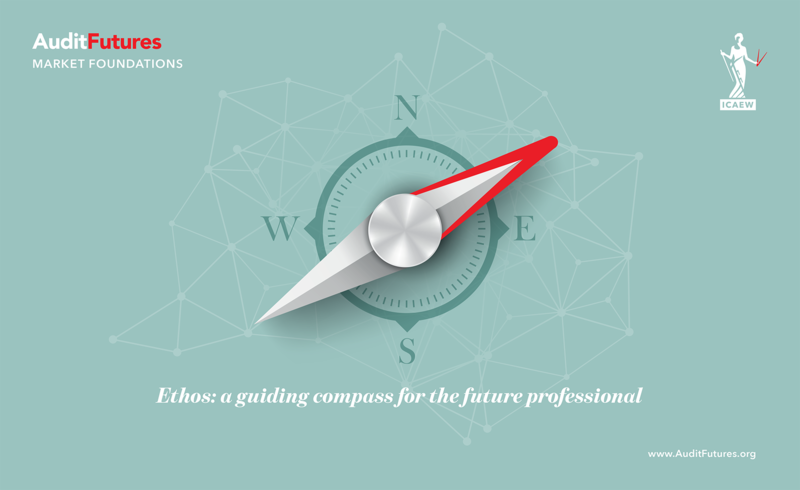 We introduce the new concept of ethos and emphasize the significance of character, qualities and purpose as necessary in guiding the work of ICAEW chartered accountants. We aim to unpack these and integrate them into the concept of ethos for the profession. While this builds on familiar grounds, it also raises some challenges the profession needs to think about.